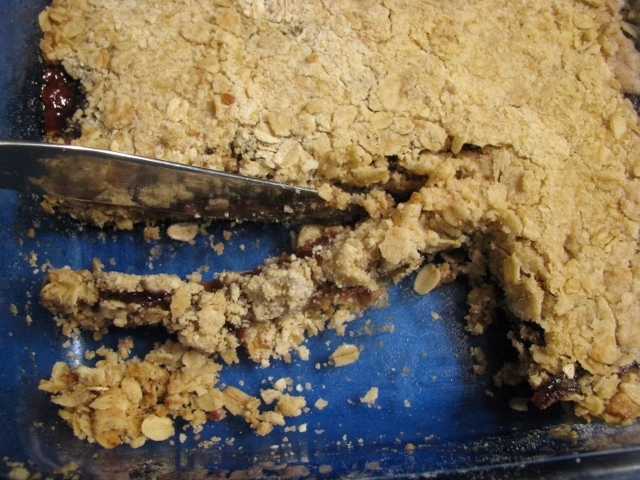 Last night, I baked this dessert – Oatmeal Jam Bars. These can be whipped up in a jiffy and I always have the ingredients on hand. Combine brown sugar, flour, baking soda, and rolled oats. Cut in the butter. Press 2 cups of the mixture into the pan. Spread jam on top, leaving a 1/4″ margin between jam and edge of pan. (Jam that gets to the edge of the pan will burn.) I used blurry grape jam tonight because that’s what I had. Blurry grape jam pictures. I have also used raspberry, strawberry, blueberry, and marmalade. You use what you like! Also, use between 1/2 cup and 3/4 cup of jam. I prefer to use 1/2 cup, but if you like it sweeter, use more. 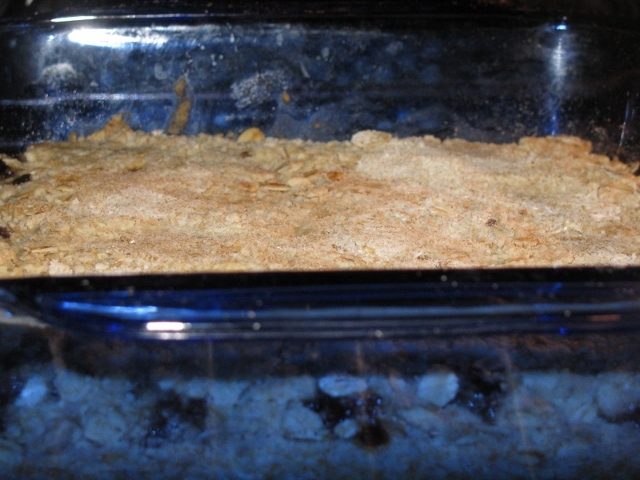 Sprinkle remaining crumb mixture over top and press down lightly. Bake. When it came out of the oven, I wanted to try a bite because I can’t remember using grape jam in this recipe before and wanted to taste-test it prior to serving. So, when it had cooled slightly I stuck my fork in the corner and took ONE bite. Then I took just ONE more taste. A few minutes later, I had to use a knife to even off the edge where I had made a mess taking several more test bites with the fork. And then I HAD to eat that piece that I had cut off with the knife as well. How is it that nearly 1/3 of the dessert is missing? Well, not really missing because we all know where it went. I am so ashamed. But I know what I will do. I will cut the remainder into bite-sized squares and put them in a container in the refrigerator. Nobody (on Earth) will know. I am going to church now to ask for forgiveness. Pray for me to mend my ways and pray that in the future, I will not eat all of the dessert before anyone else in my house has a chance to taste it. Preheat oven to 350°. Grease 8×8″ square pan. Combine sugar, flour, baking soda, and oats. 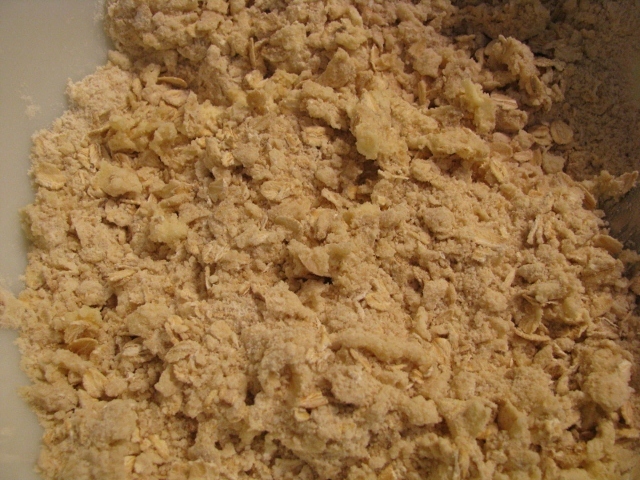 Cut in butter using pastry blender or two table knives to form a crumbly mix. Press 2 cups of crumb mix into bottom of pan. 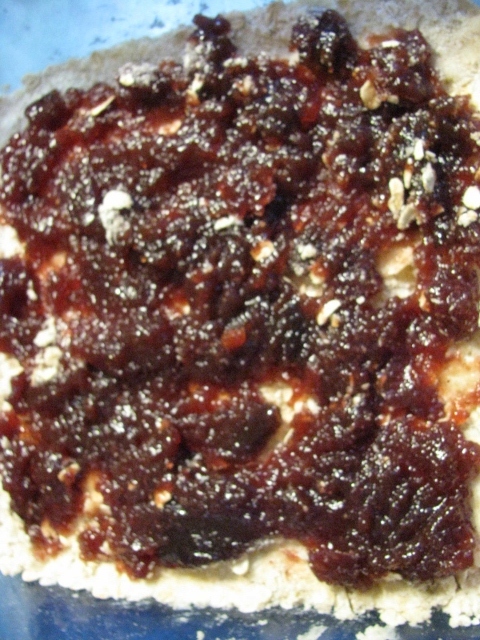 Spread jam over crumbs leaving a 1/4″ margin around edges. 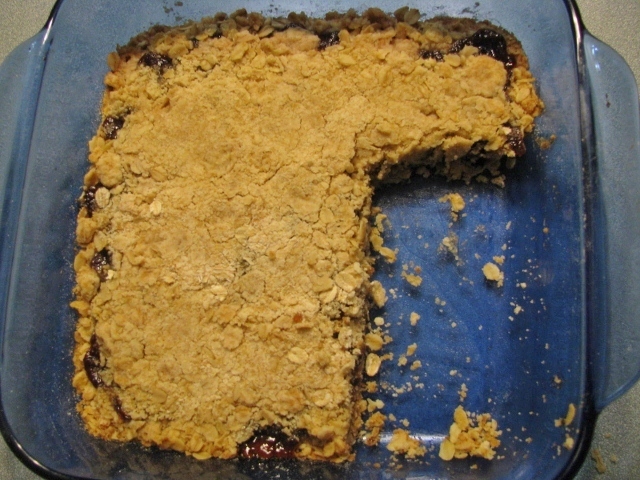 Sprinkle remaining crumb mix over top and press lightly onto jam. Bake 35-45 minutes until lightly browned. Cool before cutting into bars. Yes, the fork is one thing, but when you start evening things up with the knife. It’s a problem! Oooh. Rice Krispie Treats. Add extra marshmallows and a teaspoon of vanilla the next time you make them. And try them in the microwave if you don’t already. I made them on the stove for years and one time, I was in more of a hurry than usual, so I melted the marshmallows in the microwave. It was fast and so much easier to clean up, too! Thanks for stopping by. Enjoy your day! I’m off to make Rice Krispie Treats now. You and me both! I just had to straighten out those edges….wait, that piece is asymetrical, oops, gotta cut that one too…..
Ah yes. There is always work to be done when there is dessert in a 9 x 13 pan sitting around. Constant attention must be paid to keeping those edges straight and symmetric! Thanks for stopping by and commenting. Enjoy your desserts. Merci!